Albert and Mike are 2 of the most successful entrepreneurs that I know and what’s amazing is that they created a 475 million dollar company completely bootstrapped. Not only does MyFitnessPal.com boast over 100 million users today but it’s also an app that has helped countless people lead healthier lifestyles. In today’s interview, Albert walks us through how MyFitnessPal.com grew to a powerhouse company and ultimately got sold to Under Armour for 475 million dollars. Steve: You are listening to the My Wife Quit Her Job Podcast, where I bring in successful bootstrapped business owners, to each us what strategies are working and what strategies are not. Now this isn’t one of those podcasts where we bring on famous entrepreneurs simply to celebrate their success. Instead I have them take us back to the very beginning, and delve deeply into the exact strategies they used earlier on to gain traction for their businesses. Steve: Welcome to the My Wife Quit her Job podcast. Today I’m thrilled to have Albert Lee on the show. And even if you’ve never had of Albert, chances are that you’ve used his app called My Fitness Pal. Now My Fitness Pal is an app that helps you lose weight by keeping track of your calories and watching what you eat. 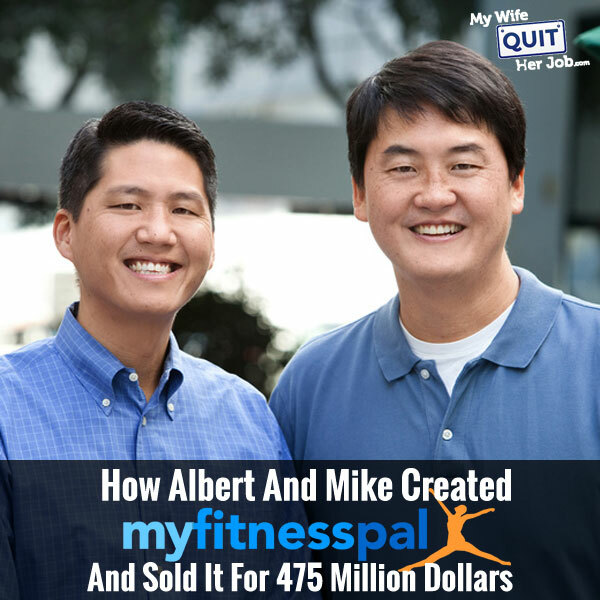 And together with his brother Mike, Albert recently sold My Fitness Pal for $475 million to Under Armour. Now what’s cool is that they pretty much bootstrapped the entire business from the ground up. And Albert is actually someone who I’ve known for many years and we mainly catch up at kids’ birthday parties of all places. Now here is what is funny, whenever we meet up, we almost always talk about our respective businesses, and I distinctly remember this moment five years ago when we were chatting, and Albert with his usual laid back head bob was like, “You know Steve, this is going all right. We are getting some traction and we are starting to hire some people.” And it turns out that that was the understatement of the century. It’s cool how My Fitness Pal has grown to a giant with over 70 million users and has helped people lose over 200 million pounds in weight. Now what I find especially cool about My Fitness Pal is that it’s a business run by two brothers, Mike and Albert. And I’m totally inspired myself by how they completely bootstrapped and sold a $475 million company. With that, welcome to the show Albert. How is it going today man? Albert: It’s going great. Thanks for having me Steve. Steve: It’s too bad we couldn’t have Mike on today, but perhaps you can tell us the story about the idea behind My Fitness Pal and why you guys decided to start it. So he took it upon himself to do it. Luckily he had a little bit of time at that point. Once again he wasn’t working, that allowed him to kind of get the product launched. But he actually ended up going back to work, and MFP sort of remained a little bit of a side project for him. Steve: Was the intention when he created the app, was it to actually turn out to be something huge, or was it more for just personal reasons in the beginning? Albert: It was mostly for personal reasons. My brother has got a little bit of a strange story; probably like many people I think who end up starting businesses. He had started programming when we were both– when he was 10 years old. So when we were pretty little. My mom had actually gone back to school to get a degree in Computer science and she would drag him along to the classes, and he ended up learning the program that way. And he had written a lot of software during kind of junior high and high school and got a little bit burned out. So when he went to college he didn’t major in any engineering discipline or didn’t major in computer science. He became a consultant, he started working in marketing. He ended up getting into medical school and declined to go. It was sort of like, I think like many people just kind of thinking, “Wow! There is got to be something else out there for me that I’d be really passionate about.” He kind of woke up one day and said, “I want to start writing software again.” And I think that kind of dog-tailed with time when he started thinking about the idea for out of picking around. So it was really a perfect project for him to think about from a personal standpoint, chances like getting back into writing code and actually building something. I think he obviously also thought about like, “Hey, I think there is an opportunity here. I think there is something really big that can become of this.” But I don’t think that was like the driver. That wasn’t where the passion came from. It was really because he just felt like this was a problem that he wanted to solve. Steve: And as the co-founder, when did you actually step in with MFP? The iPhone had come out not that long before that and the app store had launched, and some of the more popular apps early on things in the health and fitness area. So that was when he came and talked to me. He said, “I think there is a much bigger opportunity here. And unless we really dedicate ourselves to this thing, I don’t know if it’s going to happen.” So he convinced me to quit my job. People are always like, “Well how did your brother ask you to quit your job?” It’s like, “He didn’t really ask me. He just kind of told me to quit.” He said, “Albert you got to quit and work out this thing with me.” So that’s when we started working on it. So that was a little over six years ago. Steve: So you guys didn’t take a salary, right? Albert: So the business was being monetized through advertising. There wasn’t a ton of revenue there. Yeah, there was some, but we very deliberately decided that we weren’t going to take any money out of the business. In fact we obviously invested more at that point. But anything that we made from a revenue standpoint we plowed it into getting help or development or design or anything else that we thought would help the business move forward. So it was like, well we were two years before we actually took our first sort of pay check out of the company. Steve: Actually in my mind My Fitness Pal is actually a pretty ambitious project as there is just tons of weight loss and fitness apps out there. So what would say makes the app truly unique, and how has MFP managed to help so many people? Albert: Well there is a couple of things. So one is we have I think done a really terrific job in accumulating this amazing data set around nutrition, and that’s a big part of what makes My Fitness Pal easy to use– is the fact that when you come into the app, when you try to launch something that you need that we generally have that thing in our database. If we don’t, that means that you got to like go out and look for the information and perhaps try to input it all manually and that’s a little bit of friction. So a big part of how we think about the product is it’s hard enough to ask people to change their behavior. So if you come in here and you say, “Hey I want to lose weight.” That means you got to start doing things differently in your life. Well the software and the service and the tools that we provide can’t get in the way of that. If we are adding more friction on top of that then your chances of succeeding goes down dramatically. So getting all that data, really focusing on the user experience, the product and taking away all these really steps to make it something that you can do four, five times a day every single day for an extended period of time, removing all those barriers, I think was a big factor and just making it easy enough that people unmask and start using. Steve: So you have all sorts of foods. For example if I looked at monkey brain, there would be something in there on the app too, and I would know instantly how many calories were in there. Albert: Yeah. Monkey brains is probably fairly choleric, but I’m just guessing. Steve: So one of the things I love about My Fitness Pal is that it’s a feel good company. I’m sure you got many incredible stories from people who you’ve helped in the past. I just thought it would be kind of cool if you could care to share a quick success story. Albert: Sure. It’s funny because I think people get super excited to hear the story of the person who was like in really dire health, maybe they were incredibly overweight or obese and they lost a dramatic amount of weight. That’s like a super common story that people get excited about. But I think sometimes what we get really excited about; we obviously get excited about those stories also. But sometimes what we get excited about is just hearing about things that kind of fall under the category of non-scale victories, so that’s something that our members talk about a lot. And so an example of that is like we got a letter from a woman and she just talked about how she’d always kind of struggled with weight and her health and never really found something that had truly worked for her, that really resonated with her in terms of helping her understand how to govern her behavior, and how to eat and be more active. But My Fitness Pal just worked and she knew that it was working because she got up from a chair– from sitting down and she didn’t have to use her hands to push up, and it was the first time that she had done that in like 20 years. Albert: And so to her that was like this really powerful moment. This non-scale victory, like I got up. I didn’t need even to assist myself. She literally took the time to write us about just that moment. I think that kind of stuff is incredibly powerful, it’s super motivating. Steve: That’s amazing. If I got stories like that, that would just make me really happy. I bet you got a ton of those too. Albert: Yeah. That’s really what keeps you going. I think– I’m sure people in your audience can understand there is so many sort of highs and lows in like building your business. Even when things are going great you are just stressed out. There is always something that you are worried about. And to be able to hear these stories from your customers in terms of how you are helping change something for them, how you are improving anything for them is just– it really forces the fact that all the work that you are doing is valuable, and it really helps you to kind of stay focused. Steve: So let’s go back to kind of the very beginning of MFP. So first of all, how did two brothers manage to fund this company without a team of engineers? Did your brother actually write all the code for the first app? Albert: He did. So my brother was kind of the primary developer and when I came on, one of the big things that I started working on was getting an iPhone app development. So what we decided to do was we both put in some money, plus we took the revenue that we were making and we hired this guy to work for us and he was like working for us for like two days a week. He actually still works for the company now. And his only job was to work on the iPhone app and I worked with him on that while my brother was working on the website and kind of [inaudible] [0:15:05] for structure. Steve: And here is the question that’s always kind of been on my mind. You guys kind of bootstrapped the whole operation. If you can go back in time, would you have actually chosen to get funding early on to kind of increase the growth rate? Albert: No. I don’t think that there are a ton of things in particular that we could have done early on had we had money that would have really changed the trajectory or the outcome of the business. Albert: I think one of the things that’s kind of magical about our product is we don’t pay any money to acquire users. So from a marketing standpoint we never pay for installs and that’s a very rare thing to get to. We actually have 80 plus million users now, and we haven’t had to actually pay to get them. So it’s really been dependent on this kind of fly wheel of people coming in, using the product, loving it, going out, and telling others. So it’s been very product driven. And so once again I don’t know that at those early stages having money, a lot of more money would have changed those kind of things. It also actually– the big thing is you get– the longer you can wait. And I think it’s a delicate game because you do want to be cognizant of course starting out the business when you could be doing better if you had more capital. But certainly if you can wait and you can really grow things, before you decide to take any institutional money it really changes the terms of what you do that, and that’s super valuable. Steve: True. So you are saying that you never ran any Facebook ads, any paper click ads, or any sort of burner ads on any other site to get the word out? Albert: Yeah, we didn’t do that. We did– well I shouldn’t say that. So like super early on, before I even got involved with the company, my brother did run like a little bit of PPC advertising on Google. But that was literally like in the $50 a month kind of range. And then sometime last year we did a little bit of experimentation as we were expanding internationally, but I wouldn’t guess that we spent more than five grand or something. So it’s really inconsequential in terms of the size and scale of business. Steve: So that’s really interesting. So what was the early strategy for getting people to use the app? And so how did you get your first 100 users. Albert: Well the first 100 users was absolutely kind of friends and family. And I think the good thing is we weren’t necessarily like reinventing the wheel at that point. We were taking a solution that had been around for probably like 50 years, like this kind of notion of keeping a food journal and tracking your activities. Dieticians and nutritionists have been recommending that forever. But we’ve provided a digital version of it, and made it a little bit more convenient and used the benefits of technology to make it easier for people. And that’s not necessarily how we see ourselves and that actually wasn’t really the demographic that was highly active in the app early on. It was these people who really wanted to track their nutrition down to a very detailed level like how many grams of protein am I consuming everyday because they are literally competing in competitions. And those guys became very vocal proponents of the product, and that helped because you see somebody at the gym and that person is like totally ripped and they are saying, “Hey I’m using My Fitness Pal.” Just the word of mouth power there is actually really, really amazing. Steve: So were you guys apart of that community? Like how did you get the word out about the app to that community in the first place? I don’t remember you body building Albert. Albert: Yeah. If the listeners could see me they’d be like, “Wait a second here. What is this guy talking about? ”We weren’t, but there certainly were a lot of places where you could actually go and say, “Hey, we’ve got a solution around some of this.” And the thing is like because there wasn’t anything out there people were really looking for this. We did a little bit of work on SEO early on, and thankfully that kind of paid off. We did some stuff, like we made it easy for people to have these weight loss stickers. And those things obviously were put into all sorts of forms and stamped everywhere and people caught up. And like once again it was like the really active users found it, and those people became really foundation of this community that started to get built around the product. I think like one piece of advice that I’ve always given to people because they’ve asked a lot about, “Wow you got these really robust and highly engaged community of people. They are talking to each other; they are giving each other advice, and support, and knowledge. How did you guys foster that?” And I think one of the important things to consider is like, everyone wants that to be this very passive thing. But the reality is you have to invest super heavily in that. And it’s like basic things. So like things that we did that other people weren’t doing at the time was we didn’t have like just a link on our site that said community and if you clicked on that link it went to the forums. We actually intentionally surfaced foreign content right into the application on its homepage, so that even if you were interested necessarily in like going and visiting community, like you would just see people talking to each other in there, and that would lure a lot of people in. And then the other thing that we did really early on is we had people who would post. Like there is always those people who go in the forums, or kind of in the ghost town because there is not enough people yet to post, we made sure that we answered every post even if we didn’t have an answer. We just wanted people to know that if you post in here, somebody is going to post back. And eventually as more users get involved, they start becoming the ones that really take over and start answering other people’s questions, and it does have sort of take on a life of its own, but you have to be just super deliberate and very meticulous about going through that step early on. I’m glad that we did that. Steve: Let’s talk about starting a forum because I know you need a lot of traffic to make sure that it doesn’t seem like a ghost town. And it’s like a chicken and egg problem, right? Steve: So did you guys have that forum early on in the product, or was it something introduced later on once you already had an established customer base? Albert: It was something like initially used to actually asking for. I think there may be a dynamic here with regards to the space that we are in. It’s kind of digital health and fitness because you know its sort of– in general health and fitness people have more questions and answers. Albert: There is just so many things like, “If I exercise and I burn more calories, how am I supposed to like eat back those calories? Just like really basic stuff. So we constantly get like emails from people who are like, “Hey, I’d love to be able to just like talk to other members and ask them questions.” So that’s like– it was one of the first things that we ended up doing. Again, even when you do that you can’t just hope that other members are going answer any of those questions, you just got to go in there and do it yourself. Steve: So did you guys create multiple personas in the beginning to make it seem like it was more filled out. Albert: We did, we did. Actually Mike answered a lot on himself. He has thousands of posts in the forums to his credit, and people didn’t mind. I think they were happy that somebody was out there trying to get their answers for them. Steve: And at time point Mike obviously was a consumer of the product and he probably had great results as well. And so he was showing that off in the forums as well, right? Steve: I’ve actually never met your brother, but I picture this guy who is super fit now. Albert: I think that’s a very powerful sort of concept. I think when you look at a lot of really successful products and kind of fitness and weight loss phase, certainly providing inspiration to customers can be very motivating. And that’s why like if you go on [inaudible] [0:24:16] you are going to see a lot of lazy success stories. Everyone that you see is going to be just like incredibly thin and they are going to look like what you want to look like. But I do think that there is some level within our product that is very approachable because that isn’t necessarily what you see when you come and you use our service. One thing I think we recognize is just like everybody has challenges, even people who are really fit. It’s like we just wanted to make this very inviting and very open for people. Steve: It sounds like to me at least from what you’ve told me so far that word of mouth was just so crucial in the growth of your app. And so what was your social strategy? How did you kind of foster the word of mouth about your app? Now you mentioned that you had– on the front of the app, you’ve exposed a lot of the conversations. What are some of the other things that you did? It’s more of like, hey I talked to that guy who sits next to me at work because like we’ve got a good relationship and I said like I started saying like hey I’m trying this new thing and it’s pretty cool. And so like I think the traditional methods work very effective in creating these viral loops, but, and this is something that unfortunately a lot of– how easy it is for other people to replicate, but the bigger focus for us is like, just to make people successful. If they go out, they use our product for the first week, maybe they shed a few pounds in that week, they are just going very quickly to become evangelists. And that was the technique that we sort right away. And the funny part is with something like this is even for somebody who for example isn’t really naturally predisposed to want to go out there and talk about the product, they would lose so much weight for example, people will start haunting them about it. It’s like dude, you look awesome, how the hell are you doing this? And they’ll be like well, kind of shyly like well I started using this product and I’m like this [inaudible] [0:26:57] that kind of endorsement is just like super powerful. So, I’d like to say it was like this incredibly deliberate strategy, but I think the real strategy was make sure that people succeed with the product, do everything we can to make sure that they get through that first week, and if they do they are going to start talking about it. Steve: Wow! Okay, so when people were bragging about it would they be posting this on the forums or would they post it on Facebook? Where was most of the activity? Albert: Yeah. I think you know people would certainly love posting in forums because there is a community there that they know will be very welcoming to their stories, there’s a lot of people who post on Facebook now, we have a very-very active Facebook page, and now for example that’s the way the community comes and kind of engages with us and it engages with other community members. People are using Instagram a lot now. Albert: And so they can view kind of hashtag [inaudible] [0:27:57] you’ll see like people just taking pictures of their– what they are eating, or their success or they’ll take a picture– and they take a picture with like an inspirational statement or something like that. So that’s like we have a lot of other conversations happening, there is also Reddit forum, that’s pretty big. Albert: That tends to get a lot of conversations going on. Steve: So what I always kind of curious about was that giving out My Fitness Pal is actually a free App, how did it actually generate revenue earlier on? Was it just primarily advertising? Albert: Yeah. And it’s still primarily advertising. Albert: And so that’s– that was a tough part in the beginning because obviously it was harder to scale revenue, because you hadn’t just generated a tremendous amount of usage to create any significant amount of revenue, but I think the way that we looked at the business earlier on was, this is a service that gets better when more people are using it. We get more data, our community becomes more richer and more powerful, we have people who create more social connections in our service, and that’s really valuable, and it allows us to do bigger and better partnerships. And so we highly deliberately do not pursue other revenue opportunities like creating a subscription service for example, which was pretty popular amongst other companies that we recognize. Albert: And entirely focused on our growth, and I think that was a horrible thing to do as a bootstrapped business, because you always felt sort of the pain of not being able to do some– you know hire engineers or do things that you wanted. But I think being forward looking I think has greatly contributed to our ability to get the skill that we did end up getting to and really, you know that led to the outcome, selling the company recently. So, I think that’s like kind of my advice to somebody out there whose bootstrapping is like– it’s hard because I think, you have great discipline, you’re thinking really wisely about like how you are spending your money, how you’re generating more revenue access the fuel for your company. But being able to marry that with the long term view and sort of vision and mission for what you are trying to create, could be in a neighborhood for [inaudible] [0:30:31] even greater heights of success. Steve: You know what’s interesting is I have a lot of experience in the advertising space, and it’s actually not a set-it-and-forget-it type of thing if you actually want to make significant money, so were you taking private placements or was it just automated services that filled up the ads for you? Albert: We were– we didn’t have a lot of time to do private placements, and so we didn’t do very much of that, we did a little bit of it. But I think like you said even under– even in terms of like working with partners like adsense and Google obviously we’ve worked with like hundreds of different ad networks over time, like we’ve spent a lot of effort trying to optimize that, and there were huge dividends to be paid out and I’m sure like what’s to get explained, that’s something that is a great revelation to your audience, but like we– whether it was like trying to figure out something like day parting things like we spend probably a significant amount of time doing that and every time we’ve figured something out it ended up being really-really worth it. Steve: Okay. So, you talked about money and that sort of thing, so when did you guys actually decide to take on your first hire? Albert: So, we did– the way that it ended up working out is we had like just enough money to pay this guy who used to work for my brother who is a developer two days a week. So he was like the first hire, he worked for us like two days a week, and that’s all we could really afford. But literally like as it revenue grew it’s like hey I think we can pay one more day a week and he had another consulting gig that he was doing that he liked a lot less than working with us. And so every time we had a little bit more money and we were able to do that, he ended up kind of shifting one day until finally he was our first full time guy. Steve: Okay. And then once you kind of had this space and you had the iPhone app, how did your investments in the business kind of evolve over time? Albert: Well it was– we kept looking at growth opportunities, so we had the iPhone app, about I want to say seven or eight months offer that, we launched the android. That was another huge propellant for growth, I mean that was actually pretty early on in android, and so when we ended up going on there, we already had a disc [ph] track record on IOS, plus talking to the folks at Google, they were like, yeah we would love to really promote you guys and that gave us a huge amount of promotion earlier on and that helped a lot. Steve: Did you guys do anything special to make the apps more visible on like iTunes, or in the play store? Albert: Yes. So, one thing that I think at that time and I still think it’s really important that people potentially take for granted is the app description. And so, we actually tested a lot of apps descriptions and that was something like I don’t think people were doing at that time, and we found out that we were like 10 times better than the ones out there. Steve: Interesting. Okay, so you guys are split testing description, what else? The titles? Albert: Yeah. We are doing– we are, I think you get, the audience can see even today the name of our app is not My Fitness Pal, I think these days it’s like a lot more common for people to label their products in that way, but at that point like we were like the only people doing that. And I think it mattered in terms of kind of app stores, SEO but I think that iTunes was kind of search [inaudible] [0:34:07] and what not incredibly refined at that point. And I think we just had– I think even now you can see if you type like M-Y or something in search for iTunes like we are going to pop up the first thing, so we did do a lot of experimentation around that. Steve: What about soliciting reviews? Did you guys have a strategy for that? Albert: We didn’t, I think luckily for us when we really launched we– and this is different from a lot of people who ended up going into mobiles, like we had a website, we had a web community who loved us. And so as soon as we ended up getting our app in there, like our existing users went in there and they were like, we love this service, and so we’ve never really had to do anything there. Steve: Okay. So would you– if you were to do it all over again would you go that same route of developing an audience first, and then launching an app or would you have just launched the app first? Albert: I think it’s a luxury, not something like I think it’s like a very necessarily like a smart deliberate strategy, I think getting– if you can get yourself up there it really helps. I think people absolutely believe that it’s this incredible self-fulfilling prophecy like if you are the number one health and fitness app, and you are top 100 app in iTunes, that might– you’re just getting– continually getting tons of downloads because you are there on app, I think that is a little bit of a fallacy. I think what we see is yes there are some people who are downloading your app just because you are highly ranked, but a lot of it is really like still dependent on like do you have a good product? You need to have a great product to really stick there and once again many of the people that are finding our product, even now are still finding us through the word of mouth, not because they went to the app store and just happened to see it there. Steve: I can actually vouch for that in just running this podcast. Well it helps to actually be in that top of the ranks on iTunes, I’ve been– I feel like I’ve been generating most of the traffic just through building an audience on my website, and then pointing them over to the podcast, so I can totally vouch for what you just said. So let’s just briefly talk about the acquisition. Why did you choose to get acquired as opposed to remaining an independent company? Albert: The is a lot of different factors, I mean I think for us one thing that is would be a piece of advice that we would give to anyone starting a business is you really focus in the beginning like getting your product, building it, getting it out there, but pretty soon after that you’ve– you really want to start thinking about like what kind of company you are trying to build, like what are you really trying to achieve? Like what is the mission? Like why do we exist? Why is this product necessary? And so we’ve been very strong in mission driven in our company, and our goal is to really make it easy to be healthy, and so that becomes something that can be a very important lens for you as you’re looking like every other thing you do in the future, writing, responding or whatever. And as part of the acquisition it also became a really important thing which is like, this is going to help us achieve our mission. And I think on a first level we felt like wow! With the support of Under Armour, their amazing products, their incredible brand, their amazing marketing capabilities, like that we would be able to kind of expand and reach areas that would be very difficult [inaudible] [0:37:31] potentially as an independent company, and then we obviously thought about a lot other things I can talk about like economically it’s just something that’s going to work out well for an investor, it’s something that’s going to work out well for our employees and for us. What does the market look like right now? What are the dynamics, there’s a ton of competition out there, I don’t think we were afraid of that, our business was incredibly successful and I think we obviously believed even as an independent that we can continue to be really successful, but you just try to weigh all the different factors, you know there are risks out there and what– like you know we looked at working with Under, we just felt like well, these guys are people who can really help us build something amazing, and that made it kind of easy. Steve: So let me ask you this, let’s say you guys chose not to get acquired, would you have chosen different monetization methods outside of advertising? Albert: Yeah. I think monetization is something that was actually becoming a much bigger focus for us, it just– it’s the fuel for growth and at some point you do need to have a lot of resources if you want to tackle really-really ambitious things. So we were– we still are looking at like subscription, it’s simply looking at other ways to monetize. Steve: Interesting. So could you care to come in on some of those ways? You mentioned subscriptions, what about physical products or services? Albert: Yes. We dabbled a little bit with physical products, not done very much there. I think it’s not because we don’t see great opportunity there, it’s just there are a lot of different opportunities and we just didn’t have, you know that capa– we wanted to be focused, so we didn’t have the capability to exploit them all. We’re going to be, as you can probably imagine exploring all physical products because we’re being acquired by a company that makes physical products. But stuff like subscription revenue is, I think where we believe there are services and content that we could deliver to our customers, that’s really valuable to them, that they will keep willing to pay for on recurrent basis, that’s the more obvious, it’s like the parallels in– for other businesses in our space especially like once people would really have things like, weight watchers, those are all really– they are very well suited for a subscription model, and that’s where they make all their money. Steve: Okay. So my next question for you is actually kind of more of a selfish thing. So I kind of started my businesses to free up my time, but you have three kids, so how did you actually balance your lifestyle early on before it was really successful? Albert: I needed a lot of flexibility, but we didn’t have like a ton of employees, our first guy actually I didn’t mention this, the first employee was actually revoked. So he was living in Austin I think at the time. And you just don’t have a lot of overhead in terms of like meeting with people, and all that kind of stuff, like my brother was like writing a lot of code and I was like working with this other guy, and so we dint have to be together very much. So that meant that we actually had a lot of flexibility in our schedule, we worked super hard, but I could like– if I woke up at two in the night, so like help the baby I would just stay up. I would work till like seven in the morning, and then I sleep till like noon maybe– and it wasn’t like– and so there is actually a ton of flexibility in those early stages that you can leverage to make it easier on your family. And now it’s like we’ve got more employees, it happens to coincide with my kids like they’re all in school and stuff like that. So we had actually worked out nicely because now that they are on a more regular schedule, I’m also on a more regular schedule. But before, when I needed to like kind of work all over the place, my family– I could kind of work around that and vice versa, which I thought was really helpful. It’s something that was like not obvious, and I don’t know if it’s something you can really plan for, but that was something that helped a lot earlier. Steve: I was expecting you give [inaudible] [0:42:09] your wife, so I’ll give you a chance to do that right now in case she is going to listen to this interview. Albert: She is yeah. Sorry honey, but my wife was actually working, that was a huge factor. She was still working, she had a good job and she was still making money for us, and you know obviously it was still on me kind of being all over the place, and so that was obviously really-really important. And I think just having the support of someone, there is just so much anxiety that comes with starting a business, like just going without a pay cheque, it’s not so much even like the everyday, like what are you doing like is my wife supporting me by making money, but if she’s supporting me by just like making me feel free to do this, to go out there and like take a chance. And she was always very trusting and very confident that we would do right by her, that we were out there, that we were working as hard as we could and that we would eventually make this thing successful. So I can’t tell you how much I appreciated that, that she just– she never like, she never made me feel like that I was taking the success of risk even though she was a part of it too. Steve: Absolutely. I’m always looking out for you over. Albert: Thanks man, that was the hook up of the ages. Steve: So today is MFP is kind of a remote company or is everyone in an office these days? Albert: So, for the most part people are all in our office– most of the people are. We still have remote workers, and I think that is a way that you can certainly secure really great talent, in places where there are not really necessarily great companies to work at, and that’s how you compete with companies who maybe are willing to make that sacrifice and are willing to say like hey, we want to have– we were okay having people remote. So we had a bunch of people remote earlier on and that worked out fine, and almost all those people are still with us, and still working remote. So we can still make it work, but I think at some point you do or you’re trying to build this like culture in your company and that’s fine to do if there’s nobody in [inaudible] [0:44:24]. Steve: Of course. So I thought I’d close this interview by asking you if there are people out there listening who actually want to create an app or a company, what sort of advice would you give them. Albert: Well I think, so I think there’s like a couple of things that usually come to mind, it’s like, one is people tend to kind of think about the business opportunity first, and they don’t think about like who the customer is, do they really need or care about whatever they are trying to create. I think it’s like something you gloss over because you are like hey! Won’t you want that, If you could have that? And it’s like yeah, I think a lot of ideas sound great would you say it that way, but then you can focus on like that a business is okay forward and it’ll make money through advertising, we can do all this stuff. And so I think the first thing is like, do you really focus on like trying to figure out in any possible way whether you really think customers are going to care about your product. So like there are so many ways to do that. You don’t have to build anything. You don’t like say for example, like sometimes people would say I want to create this thing and it’s going to help you in circumstance when you need to like reference somebody’s information for like a sales call. And I’m like, okay, well how do you know that people need that, it’s like why, I feel I need it all the time. And I’m like well, why don’t you take this week, take a notepad and just keep it with you, or like use your phone notepad. Every time you think you need that product just write it down like check the box, you know, put a tick, if that is like one or two by the end of the week, then you are probably wrong. It’s like you– if you feel like oh! crap I can– six times this week I needed that, this like really basic stuff like that you can do it. So just spend a lot of time validating that, and you can once again you can do that and you can do that while you have your job, you don’t need to go out and build anything. If you want to try to and build something like draw it out, jot it out on people, like use a paper prototype and show it to people, I just think people get obsessed with like, I got to go out and hire developers and testing stuff, it’s like, no, you don’t have to do any of that. Steve: So just as an aside, how did MFP do it’s early validation? Albert: Well, I think Mike you know– luckily for him, and I think this is what everybody has the fortune of having, like he was able to build a bunch of things really early, but I think even in that case what he did was, he didn’t go too far. He just showed people stuff, even if there was like supper wrath, like you can search and ad of food like how does this feel to you, and it’s like oh! Well that seems pretty simple, it would be cool if you could do x, y, z and I think going through that process and never feeling sort of ashamed of showing people stuff early is like a great thing to be thinking about as an entrepreneur. I think the one other thing that– I was listening to your podcast. I’ve listened to just a bunch of different episodes and I think that one thing that I feel like is great about bootstrapped entrepreneurs is like it was really as experience for me as a bootstrapped entrepreneur that I felt all the time is like what I would tell people that we were bootstrapping, I felt that people would always make it seem like that we weren’t doing something important, or that we weren’t trying to build something big, and that kind of talk really– I think it can kind of poison your mindset in some ways. And so the one thing I just want to say is like dude, you should always be thinking about your business and like it doesn’t matter where the money is coming from, you can build something big and amazing. And don’t let other people’s opinion or thought process on bootstrapping affect that. Steve: I here you there. I think it’s just RO [ph] factor of where we live and how the basic community, all my friends they are in funded start ups, so it’s actually kind of rare to see a bootstrapped guy especially one such as yourself where MFP has gone on to be a super successful company, and I think it’s just an RO factor where we live. Albert: Yeah, it’s like you are working on this cool family business, that’s nice and it’s like, no it’s awesome. Steve: Yeah, actually really quick last question. When did you guys know that it was going to be more than just a lifestyle business? Was that the intention in the beginning, or was it always to just kind of go big once it started getting traction? Albert: We’ll I think the– maybe the way I will characterize is like we had big goals, but we knew that we didn’t need to be humongous for us to be happy and successful. So I would say that like we kind of went into the [inaudible] [0:49:06] like we’re not like conquering the world that–this isn’t what we want to become, this is about what we want from this. And so I think in that way maybe you could characterize it as a lifestyle business, we wanted to work on something cool that we were passionate about, and we wanted to make sure that like we can make it successful enough so we could keep doing it. And that’s how we thought about it, and unfortunately I think once we got out a mobile, things really took off and I think that’s when we started realizing well, this is like a millions and millions of people opportunity. Steve: Okay. Cool, Albert I really appreciate your time, and I’ve learnt a lot from this interview and it’s just really nice to get an insight of someone who’s actually made it in the bootstrapped business world. So thank you for coming on. Albert: Yeah. Thanks for having me. Steve: So if anyone has any questions for you, do you have like a twitter handle that you use or-? Albert: Yeah. It’s @Albertlee all one word. Steve: Okay. Awesome, once again thanks a lot for coming on, and really happy to finally have talked to you. Albert: Yeah. This is great, I’ll keep listening. Steve: I’ll catch you at the next birthday party. Hope You enjoyed that interview, what I like about Albert is that he’s so down to earth and easy to talk to, and it just goes to show that you don’t need to get funding in order to produce a nine figure company, you just need to watch what you spend and focus on what matters most for your business. For more information about this episode go to MyWifeQuitHerJob.com/episode68, and if you enjoyed this episode please go to iTunes and leave me a review. Because when you write me a review it not only makes me feel proud, but it helps keep this podcast up in the ranks so other people can use this information, find the show very easily, and get awesome business advice from my guests. It’s also the best way to support the show. And please tell your friends because the greatest gift you can give me is to provide a referral to someone else, either in person or to share it on the web. Once again I just want to thank Bigcommerce for sponsoring this episode. Bigcommerce is one of the best shopping carts that I recommend, if you want to start your own online store without having to worry about anything technical. They’ve got an incredible theme store where you can choose from a wide variety of attractive store designs, so you don’t really need to hire a designer. And they also offer integration with AliBaba, so you can easily find products to sell online. So bottom line, everything from design to sourcing to payment processing is all built in, and all you just have to do is populate it with your own products. And you can literally start your store in a matter of hours. Simply go to www.bigcommerce.com/mywifequitherjob, sign up and you’ll instantly receive one month absolutely free. Once again the URL is www.bigcommerce.com/mywifequitherjob, thanks for listening.